Once your game has been approved and published on Xbox LIVE Marketplace, it will be available for sale to all regions that can purchase Xbox LIVE Indie Games. All download history and purchase information can be found in the My Business section of the XNA Creators Club web site. However, in order to get paid, you will need to submit your personal and tax information. If you are an independent game developer and a non-U.S. based creator then the task of processing your personal and tax information can be very challenging. Therefore, this blog post attempts to shed some light on the process, and ensure payment is made from the sales of Xbox LIVE Indie Games. Note: I am not a tax advisor; pls do not read the following as defacto or proven advice. In order to get paid, creators must enter their personal and banking information on the XNA Creators Club web site and submit the relevant Form W-8 tax form to Microsoft. Form W-8BEN is the most frequently submitted form: I will refer to this as Form W-8 from now on. Independent game developers who are non-U.S. based creators, may be eligible for a reduction or exemption from U.S. income tax on their revenue, provided their country has a tax treaty with the U.S. If this is the case, then you may be able to take advantage, providing you have a relevant Individual Taxpayer Identification Number (ITIN) and submit a properly completed treaty claim on Form W-8. Determine if your country has a tax treaty with the U.S.
Navigate to the United States Income Tax Treaties page on the IRS web site. If your country is listed then your country has a tax treaty with the U.S. If your country has a tax treaty with the U.S. then you may like to take advantage in order to claim a reduction in U.S. income tax. Therefore, you must apply for an ITIN and submit a properly completed Form W-7 to the IRS. Note: an ITIN is not strictly required to get paid, although without it you will be subject to an automatic 30% U.S. tax withholding, even if your country provides a lower rate of U.S. taxation. Important: the process of applying for an ITIN alone can take weeks / months and it is easy for the ITIN application to be rejected by the IRS if Form W-7 is not completed perfectly. 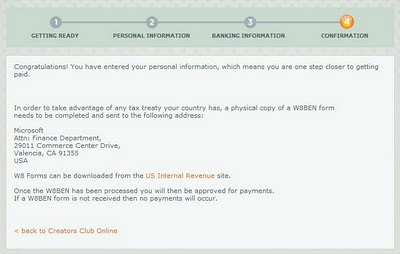 If your country does not have a tax treaty with the U.S., or you decide not to take advantage of the tax treaty, then leave U.S. Tax Identifier blank and check the box. 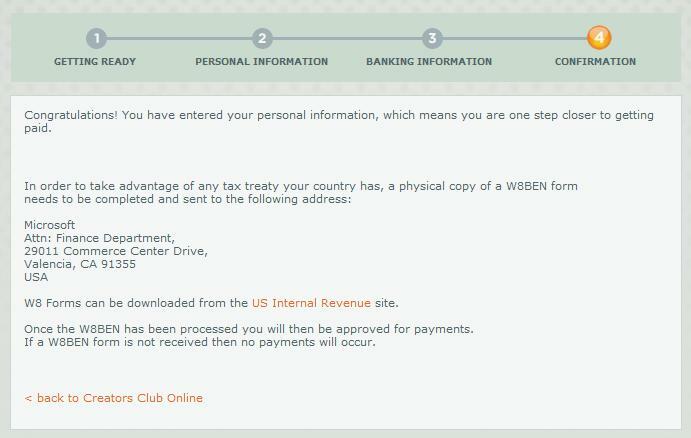 If / when you have obtained an ITIN, you can enter this as the U.S. Tax Identifier and leave the box unchecked accordingly. The panel states you will now need to submit a physical copy of your Form W-8 tax form to Microsoft. The panel may also state which particular Form W-8 tax form you need to send, e.g. Form W-8BEN. Option 1: you cannot claim a tax treaty with the U.S or you choose not to take advantage of the tax treaty because the effort to obtain an ITIN is too time consuming, too difficult, or you cannot wait. Option 2: your country has a tax treaty with the U.S. and you would like to take advantage in order to claim a reduction in U.S. income tax. Download and print the latest Form W-7. Follow the instructions carefully (recommended). Remember: if Form W-7 is not completed perfectly then your ITIN application will be rejected by the IRS. When you check box (a). Nonresident alien required to obtain ITIN to claim tax treaty benefit with a foreign country, also check box (h). Enter "Exception 1(d) – Royalty Income" on the dotted line next to box (h). Also, enter treaty country, which is your country of residence, and treaty article number 12. Important: Form W-7 line instructions state "Enter N/A (not applicable) on all lines that do not apply to you. Do not leave any lines blank". Also remember all dates must be month / day / year format. Documentation: as Microsoft is the withholding agent, you will need to complete and attach the following letter. You will also need to send identification document(s). If you submit an original valid passport (or a notarized or certified copy of a valid passport), then you do not need to submit any other documents. Once you obtain an ITIN, you can now complete Form W-8 as per option 1. However, this time enter your ITIN on line 6. U.S. taxpayer identification number and check box SSN or ITIN accordingly. You must also complete Part II Claim of Tax Treaty Benefits: Check box (a). and enter your country on the dotted line. Also, check box (b) as the U.S. taxpayer identification number is stated on line 6. The beneficial owner is claiming the provisions of Article 12 of the treaty identified on line 9a above to claim a 0% rate of withholding on (specify type of income): Royalties. Explain the reason the beneficial owner meets the terms of the treaty article: I am a XXXX citizen and resident of XXXX receiving royalties from U.S. source. Option 3: although you can claim a tax treaty benefit, you would like to get paid immediately: Submit Form W-8 without ITIN as per option 1. and ensure payment is made from the sales of Xbox LIVE Indie Games. Next, submit Form W-7 to obtain ITIN as per option 2. While you ITIN application is being processed, or if your ITIN application is rejected and you need to start over, you will still continue to get paid regardless. When your ITIN is approved, submit Form W-8 with ITIN as per option 2. Finally, if you are new to XNA game development, there may be one other option worth considering: submit Form W-7 immediately. By the time your game is published you would (hopefully) have obtained the ITIN. Therefore, you could enter your personal and banking information on the XNA Creators Club web site: Enter the ITIN as the U.S. Tax Identifier, leave the 30% U.S. tax withholding box unchecked, and submit Form W-8 with ITIN from the outset. This blog post is really helpful for non-US residents who are independent game developers in terms of tax payments. Since taxation is an essential mark of government administration, individuals must see to it that taxes has been processed properly and then paid on time. When it comes to office-based game developers, may it be non-US residents or not, it is the common practice to withhold their tax payments by the company where they work. These companies may use payroll software just to accomplish the overwhelming task of payroll preparation, including tax reports. Some of the advanced payroll software packages that has been introduced online include Peachtree Quantum and Peachtree Quantum 2011. Thanks for the enlightening post, Steve! Very helpful. Do you have a company or are you just an individual? We have a company so I'm a bit in doubt if I should sign the W-7 as an individual or the company? Thanks for your feedback. I am an individual game developer therefore I only really know the process for ITINs. I have read on the XNA forums that an EIN may be easier to obtain but I can't really comment on this myself. Steve thanks for detailing all of this, I would have found the process much more daunting had I not seen first hand how someone in a similar position to me had dealt with it. Thanks for your feedback. Glad the article was helpful; has helped many other Indies too...!